Rudy is a 5 year old, male, neutered, German Shepherd with a two year history of calcaneal fracture and arthritic changes of the tibiotarsal joint secondary to trauma. Patient had been maintained on Gabapentin (14 mg/kg twice daily (BID)), Tramadol (4mg/kg BID) and Rimadyl (2mg/kg BID). After approximately 16 months with only slight improvement of patient’s discomfort, owner elected for full limb amputation. Following amputation, significant improvement in general comfort was noted, but patient had continued difficulty rising from a sitting position as well as maintaining a standing posture on the right hind limb. After multiple acupuncture treatments over an 8 week period, Rudy bas significantly improved in regards to comfort, stability and quality of life. Previously prescribed medications have also been reduced. Gabapentin was discontinued, Tramadol reduced to 2mg/k.g as needed, and Rimadyl to 2.5mg/kg as needed. Patient bas also significantly increased activity, with owner noting extended mobility of up to 12 miles traveled (via GPS collar) in a single day. Treatment will be maintained at approximately 1 treatment every 7-14 days, as needed to maintain comfort. Rudy is a 5y/o MN German Shepherd, initially presenting in February 2016 with Grade VNI lameness of the left pelvic limb. December 2014: Patient was attacked by a coyote. Presented to primary DVM with significant trauma to left hind limb. Primary wounds were cleaned and debrided, and left open to heal by second intention. Patient was prescribed Rimadyl and Trimethoprim-Sulfonamide. February 2016: Patient presented to Veterinary Associates . Over the previous two years, patient’ s condition had remained unchanged. Wounds had healed with no significant complications. Radiographs were taken to assess for any skeletal abnormalities, revealing a non healing transverse fracture of calcaneus as well as significant arthritis of the tarsus, spanning all four articulating interfaces, though most severe in the tarsocrural joint. Referral to a board certified surgeon confirmed poor prognosis for reduction of fracture and return to normal function. Continued prescription of Rimadyl, with the addition ofTramadol (50mg) 2 tab PO BID. July 2017: Owner appreciated continued discomfort, with no improvement noted. Initiated administration of Gabapentin (500mg) l capsule PO SID. August 2017: Surgical amputation of left hind limb performed via complete coxofemoral disarticulation. Surgery was successful, with an uncomplicated recovery. Patient maintained on previously prescribed medication with the additional ofFentanyl (l00mcg/hr) patch for 3 days to treat postoperative discomfort. October 2017: Owner was referred for additional assessment, and treatment with medical acupuncture after significant discomfort during rehabilitation. Owner had noted patient having difficulty rising from a seated or sternal position, poor ambulation, as well as general weakness and discomfort. • Musculoskeletal: Discomfort associated with palpation of epaxial musculature, as well as significant discomfort associated with Jumbosacral region. Patient moderately resistant to palpation of right coxofemoral joint, stifle. No crepitus or restricted movement appreciated. Moderate weakness and discomfort of the right hind Limb, with noted collapsing of the limb. Compensatory changes in thoracic limbs including; taught bands throughout supraspinatus, and infraspinatus, trapezius, splenius and additional cervical musculature. Tension of supraspinalis, iliocostalis, and longissimus also noted from thoracic to lumbosacral region. Full assessment of the patient and review of the history indicated an approach focused on neuromod ulation of the pelvic nerves, strengthening and stabilization of the pelvic limb, endogenous modulation for pain, and trigger point therapy of compensatory mechanisms. Focus of pelvic nerves include; Femoral n., Sciatic n., Cranial and Caudal Gluteal n., Ischiatic n., and Tibial n.. Primary focus of stimulation associated with nerve origin within the lumbosacral spinal cord, as well as continued modulation along the Bladder , Gallbladder, and Stomach channels for peripheral stimulation. Stimulation of musculoskeletal stabilization focused on points associated with the coxofemoral and stifle joints, as well as trigger points of thoracic limbs. Thromboembolism of lumbar spinal region during surgical intervention, osteosarcoma, osteoarthritis, intervertebral disc disease, hyperadrenocorticism with secondary ligamentous weakening, myofascial strain due to compensation secondary to limb amputation. Excessive strain placed on right pelvic limb secondary to amputation of contralateral limb. Resulting in weakening of musculature, tendons and ligaments of right hind. Treatment along the bladder line was utilized to stimulate nerves along the thoracolumbar, and lumbosacral spine that are associated with innervation of the pelvic limb. Treatments performed with dry needling, electroacupuncture, and moderate soft tissue manipulation/massage. When utilizing electrostimuJation treatment was focused on the caudal Bladder Line, the density disperse setting was utilized in order to achieve both endogenous opioid stimulation as well as non opioid analgesia. Low frequency ranged from approximately 2.5-4Hz, and high frequency was approximately 80Hz. Time applied ranged from 7-15 minutes as patient allowed. Electrical stimulation unit utilized for treatment is a Accuall Model 91-10. ST 34, 36 (Needles: Seirin 16×30, and 20×30): Implemented to promote relaxation of taught musculature, tension and inflammation affecting stifle and gait of the hind limb. Neuromodulation of region and femoral nerve also used to promote strength and stability. GB 29, 30 (Needle: Seirin 16×30, 20×30): Treatment for sciatic and cranial gluteal nerve dysfunction, as well as inflammation and muscular discomfort of the coxofemoral joint secondary to abnormal gait. GV 14 (Needle: Seirin 20×30): Parasympathetic affects, and proximal point for neurologic dysfunction. BaiHui (Needle: Seirin l6x30, and 20×30): Parasympathetic effects and lumbosacral discomfort. After 10 treatments performed over a period of 8 weeks, the patient has improved in both comfort and mobility. Dry needling of the musculature of the forelimbs and cervical region resulted in significant improvement of movement and comfort, due to local change in blood flow, twitch fibers, oxygenation and interrupting noxious feedback (1). With the reduced stimulus, and myofascial discomfort, an increased range of motion and stability is appreciated resulting in an improved gait. Hindlirnb discomfort and weakness have been significantly improved utilizing electrostimulation. Endogenous opioid release as well as decreased serotonin concentration within the cortex, acting as a sedative and eliciting an analgesic effect via the descending pain inhibitory pathway has significantly improved function and quality of life (2). Reduced discomfort associated with the coxofemoral and stifle joints bas also been noted. This was achieved through the reduction of noxious inputs by activation of a variety of bioactive chemicals through peripheral, spinal, and supraspinal mechanisms. These include opioids, which desensitize peripheral nociceptros and reduce proinflammatory cytokines, and serotonin and norepinephrine, which decrease spinal pain receptors (3). 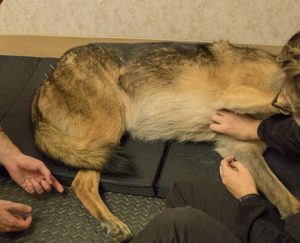 Through the use of dry needling, electrical stimulation, as well as manual therapy, significant improvement has been appreciated by DVM and owner. Transitioning from a sitting position, or sternal recumbency , patient no longer requires significant forward momentum with multiple ‘ skipp ing’ motions of the hind limb to obtain stability. Rather, a single fluid motion resulted in a stable stance. Patient also had a significant increase in activity. Prior to treatment, the owner bad appreciated a lack of willingness to travel any significant distance. After treatments, a OPS collar was purchased and had tracked the patient across multiple days with significant distances covered, ranging from 3- 12 miles within a 24 hour period. The previous treatments provided, including previous pain medications and surgical amputation, had improved quality of life and comfort moderately. Surgical intervention had previously been the greatest improvement the owner had noted, though following surgery, patient experienced continued discomfort and an unwillingness to engage in significant activity. Treatment with acupuncture has resulted in substantial improvement in regards to comfort, mobility and therefore quality of life. Reduction of chronic medications has also reduced concerns in regards to long term side effects and systemic effects of the medications.